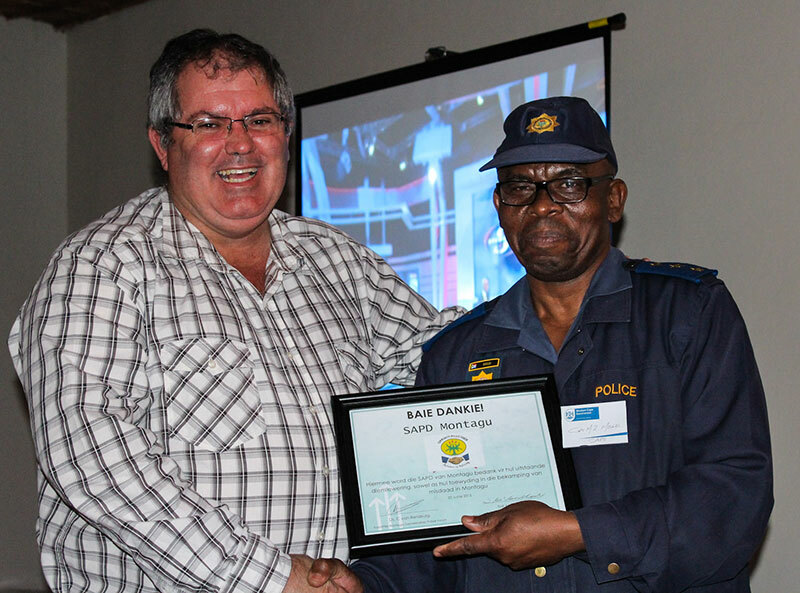 The Montagu Community Police Forum organised a social event and braai at the Bowls Club on Saturday the 20 June, to thank the Montagu Police Force for their service to the community, their attention to duty and commitment to fighting crime in our area. Funded by generous donations from the business and farming communities, guest houses, restaurants, hotels and the public, the event was thoroughly enjoyed by all. Tug-a-war, sack races and arm wrestling got the party going, especially when teams of light weight junior police men and woman tugged their heavier officers off their feet. In expressing the Forum's thanks, Vice Chairman, Terry McCulloch, said no police force, no matter how competent and committed, could stay on top of the fight against crime without the help and support of the local community. In Montagu the Community Police Forums and Neighbourhood Watches provided organised structures for this to happen. He appealed to everyone in Montagu to get involved if we want to remain one of the safest towns in the country. The tangible benefits of doing so, he said, were clearly demonstrated when the Neighbourhood Watches in Montagu South and Ashbury were established. Over the past year crime rates in these areas have dropped dramatically. The evening concluded on a high note, with resounding applause for the front line organisers, Thelma Mills and Astrid Bridger, their team of helpers and a grateful vote of thanks went out to everyone who contributed soups, salads, potato bakes, bread and cheese, great deserts, wonderful Karoo lamb, wors and steaks which kept the fires burning well into the night. Last but by no means least, Terry conveyed the Forum's very sincere thanks to the Bowls Club for the use of their facilities, and for helping to ensure that the evening was a great success.